Home > Google News > Google In-Depth Rich Snippets Articles? Google In-Depth Rich Snippets Articles? 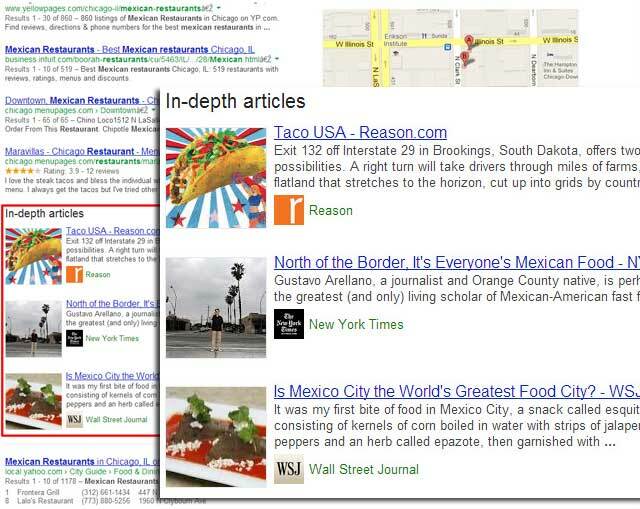 Google has confirmed that they are testing a new type of search result, maybe a rich snippet, named "in-depth" articles. Peter Meyers (@dr_pete) from Moz emailed me screen shots, which I still cannot replicate myself. But Google did confirm for me at Search Engine Land that this is indeed a test and not a browser extension. Clearly, these are local reviews of restaurants that match the query in that location. In this result, the query was for mexican restaurants, the search was done while in Chicago. The in-depth results came from Reason, New York Times and Wall Street Journal.